Over the years, study after study has been developed with the best intentions of helping our region identify areas of focus that would allow us to grow businesses, start new ones, and and increase our activities in these “hot cluster areas” that could help to build another leg of our economy which could eventually help us flatten out the negative impacts of defense spending cuts. Our challenge is in taking a study and turning it into action. Our challenge is is working together regionally to do this. Our challenge is to let the world know that there is an ecosystem of activity and support. Our challenge is to build jobs so qualified workers want to stay here to work and live. This requires actually building something. Let’s not just study and sit. Let’s not just listen to speakers and go home. Let’s create some tangible foundations of business on high-growth opportunities and support those involved to the extent they grow and hire. With that in mind, the Hampton Roads Innovation Collaborative (HRIC) is working to launch an innovative business accelerator project to speed entrepreneurship and job growth by harnessing regional assets. Accelerators in cyber security, data science, bio-science and sea-rise mitigation are expected to provide solutions to Hampton Roads’ pillar industries, branding the region as a Mid-Atlantic technology hub founded on collaborative advantage. Dan Bell, president of HRIC commented: “This plan is a very sound way of actually implementing a strategy. The multi-point approach touches on the key elements and may be used as a model for other cities around the region and in fact, other clusters of interest. The idea of a collaborative approach, working with other entities and cities is exactly the approach that we need. Any city that wants to participate has the chance to benefit and if many benefit, the region benefits. 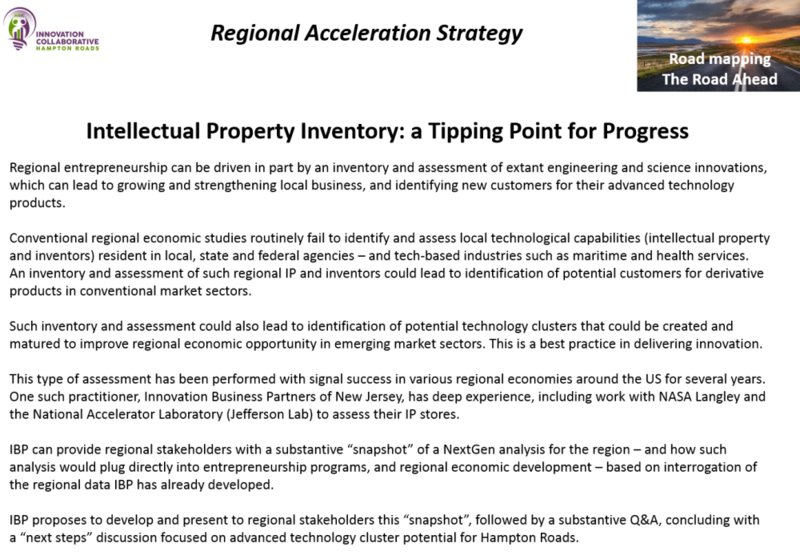 When done reading this overview, navigate up to the top/right of this screen where you’ll see box titled Clusters. In that box are active links to the new web sections specifically assigned to the topic selected. HR Cyber Works – a collaboration of public, private, educational and nonprofit stakeholders, coordinated by a small staff — will help establish Hampton Roads as a data science hub of entrepreneurs, service providers, and universities focused on meeting local cyber compliance and protection needs of Hampton Roads’ economic pillars: the maritime, legal, banking and health services industries. Serial pilot projects will characterize the Cyber Accelerator. This regional strategy is a jobs engine, a technology engine, a business growth engine, and an education engine – designed with a lean, cost-effective management structure. The goal of business accelerators is to mobilize and concentrate current regional assets that can drive innovative solutions to problems facing Hampton Roads’ economic pillars, and create on-ramps to emerging markets. 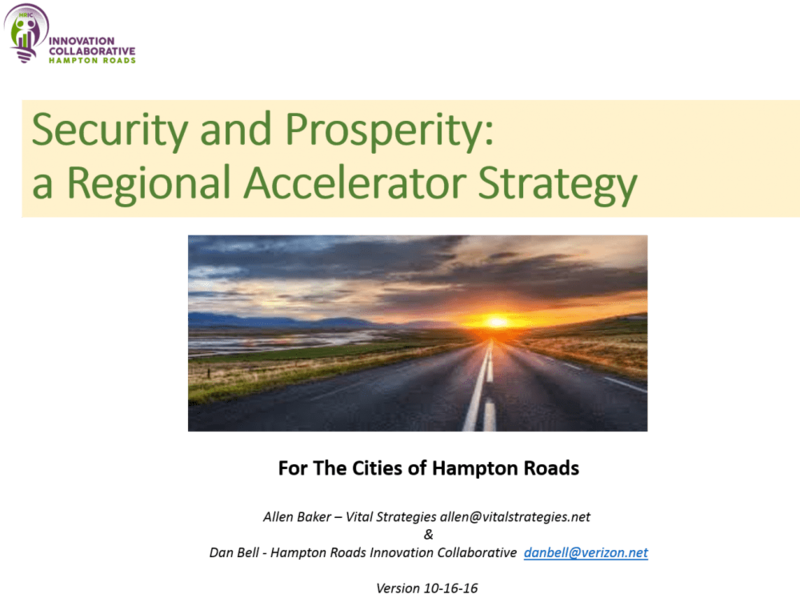 The strategy’s principal objective is to customize accelerators for at least eight initiatives now rising in Hampton Roads. These describe a business acceleration framework. 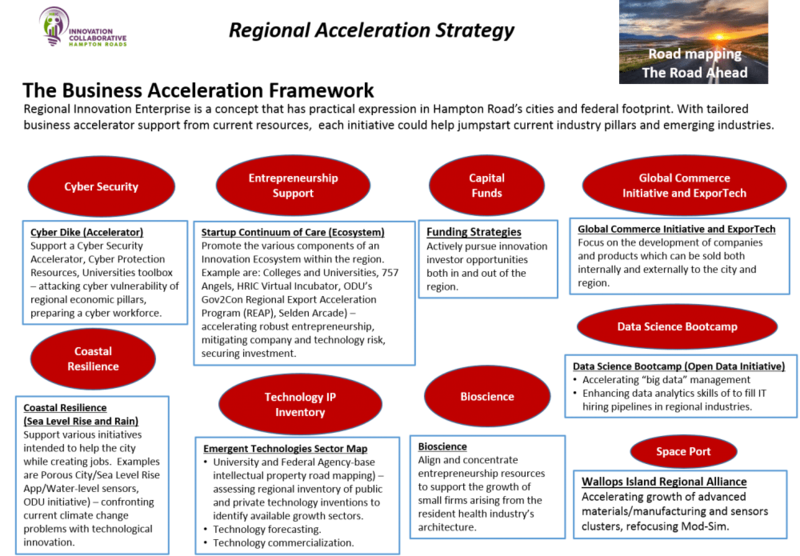 The strategy’s action sequence calls for accelerators designed to commercialize promising R&D work in the eight named initiatives, starting with cyber security. 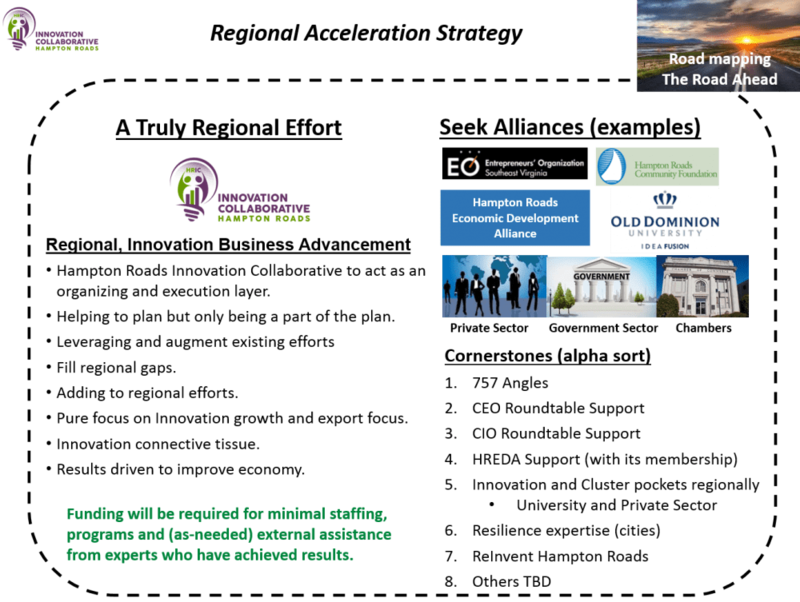 Critical support is provided by Hampton Roads Innovation Collaborative (HRIC) – an independent regional non-profit focused on regional innovation activities.